As the owner or manager of a large, multi-storied building, parking lot structure or other such facility, you know that keeping the building in compliance with various regulatory codes and rules is essential. This is especially true with stairwell identification signs that help occupants quickly exit the building in the case of a fire or other emergency. Yet as you get busy and concerned with more pressing and immediate matters, you can overlook details associated with building compliance. Yet keeping your building in code is essential per fire inspector rulings as well as ADA compliance regulations. Failure to comply properly could result in hefty fines or worse. Admittedly, fire inspection compliance rules are not always so easy to understand, which sometimes leads to individuals accidentally installing the wrong signs or the right signs in the wrong spot. For these reasons, you should consult with local fire inspectors to ensure such signs are posted in the proper inside stairwell locations. Though there are a number of websites selling ADA signs and braille signage, you can gain peace of mind knowing that the signs for sale at STOPSignsAndMore.com are legit meeting ADA and fire inspection compliance. 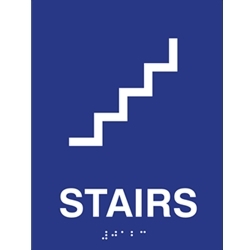 Such stairway identification signs, frequently referred to as International Fire Code (IFC 1022.9) signs, have the tactile text and grade 2 braille (12 inches by 18 inches) as required by law. Notably, the signs also meet the more stringent requirements of the state of California. In regulatory terms, they also comply with the layout per code 2012 IFC 1022.9 and CBC Title 24 Code 1022.9. If a fire or other emergency situation occurs, posting such signs in the proper stairwell location ensures that the greatest number of building occupants will see (or tactilely feel) the signs and be able to best exit the building - according to NFPA.org. STOPSignsAndMore.com also offers the more noticeable top-covered aluminum signs and the glow-in-the-dark LaserGlow® signs that illuminate even during a power outage. Such signs are being required in more and more locations such as in New York City. So be sure to verify that your building’s stairwell identification signs, as well as other ADA signage and braille signage are up-to-date with the latest codes and regulations. This is especially important for International Fire Code (IFC 1022.9) signs, which building occupants depend on to exit a building safely and efficiently in the event of an emergency.